Winter weather definitely does a number on my skin. As the air gets colder and more dry so does my skin. It never fails that with the drop in temperatures I have to revamp my skin care routine. I've been trying out a number of new products since December and want to share my thoughts. I like to really give a decent period of time to try products, not only to see how my skin reacts but to be able to honestly and realistically share those findings with all of you. I suffer from lots of different skin aliments. I did have adult acne (it seems to be under control for the time being- hallelujah) so I have some acne scaring and do get the occasion blemish and worse yet, cystic acne flare up. I have some sun spots as well as melasma from my two pregnancies. My skin fluctuates from being dry to oily so I say it's combination but the truth is it's usually one or the other at a particular time. Now being more on the dry side. This causes me to have to adjust my skin care as well as my makeup routine. More on that in another post. This past Christmas I put the Glow Pro on my wish list and Santa did not disappoint. It is a micro needling tool for personal use. You can also go to a dermatologist for a much more intense version but this is the home tool. I like the tool a lot. It lightly punctures the skin with tiny holes which are supposed to help stimulate collagen growth and allow skin care products to permeate deeper into the skin making them much more effective. It is a little investment but for a tool that you can use over and over, I think it is definitely worth the money. 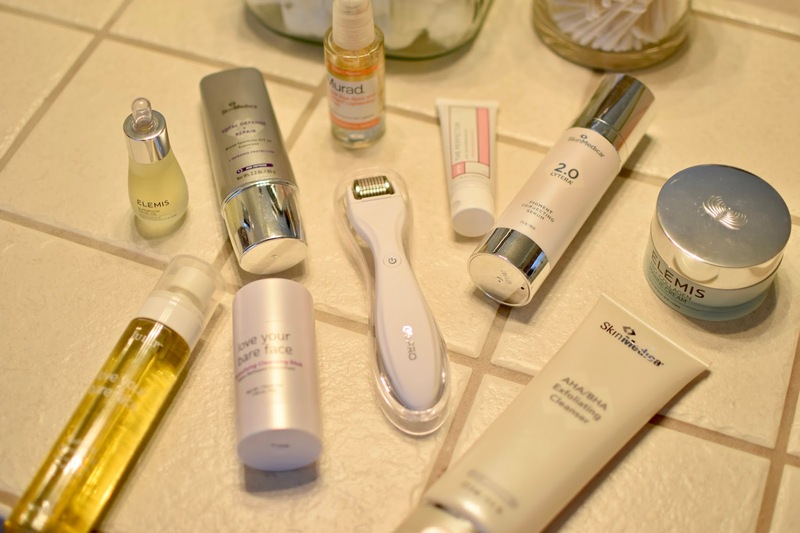 The Elemis and Julep products I have been using on and off for over a year and I am a fan. The Julep bare face and oil cleanser remove makeup from the skin without water. It was hard for me to accept that these products would work at first but they do. It's a different way to wash you face and you do wipe your face clean after using the products but since water on your skin can actually dry it out I find myself using these a lot more in the winter to help retain all the natural oils in my skin. When I need to add a little more I use the Elemis super food facial oil and their marine cream. This cream is my jam! It's super hydrating with a nice silky feel. Plus, I'm all about the pro-collage as I get older- need all the help I can get. Recently, after visiting the dermatologist about the dark spots and pigmentation on my skin I started using Skin Medica products. Since Kevin and I haven't ruled out the possibility of a 3rd baby (yes, I know, we're a little crazy) I can't use lasers or products with retinol. This line from Skin Medica is a safe alternative to help lighten the darker spots and brighten my skin. I will say I'm still on the fence. I have noticed a lightening of my sun spots and acne scaring but not of my melasma. However, I'm not certain if it's from the products or the winter months out of the sun? I will say, I really like the cleansing scrub with tiny beads. It exfoliates nicely. And I like the SPF a lot. It is an SPF 35 but it doesn't leave my face white or with a heavy reside. I have also tried the Murad lightening serum but I did not feel it did anything to help, so skip that one. I typically exfoliate my skin once a day or at least 5 times a week but I definitely wash my face every night to remove makeup and often in the morning to refresh my skin. I use the Glow Pro about 3-4 times a week at night but should use it more, I just get lazy and tired. It really only takes a few minutes. Then I try to moisturize as needed 3-5 times a week. It's been working well the past few months so I'm going to keep it up. Even if you are using the most costly skincare products and your diet is not healthy your skin will suffer. To improve your skin through your diet make sure your include salmon, grilled fish, lots of green vegetables, sweet potatoes, nuts and seeds.